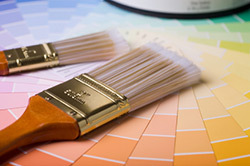 Some people are afraid of using color on their interior walls leaving everything white. White is safe, or is it? There are hundreds of whites to chose from, pure white, pink, yellow, blue undertones to name a few. Which white is right? Would one wall of color make your furnishings look new? Two walls? Three walls or four? Color can alter the illusion of a room from big to cozy, small to large, color can affect moods; color creates drama and energy. With good use of color, your home will flow together creating a comfortable environment and appeal. Whether you need support with getting started, one room or more, together we can achieve a livable or saleable home. Contact me; I’m looking forward to hearing from you. This will be a fun experience.